Throughout his career Rembrandt took as his primary subjects the themes of portraiture, landscape and narrative painting. 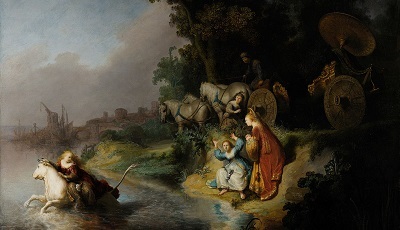 He was especially praised by his contemporaries.They extolled him as a masterly interpreter of biblical stories for his skill in representing emotions and attention to detail. Stylistically, his paintings progressed from the early “smooth” manner, characterized by fine technique in the portrayal of illusionistic form, to the late “rough” treatment of richly variegated paint surfaces, which allowed for an illusionism of form suggested by the tactile quality of the paint itself. 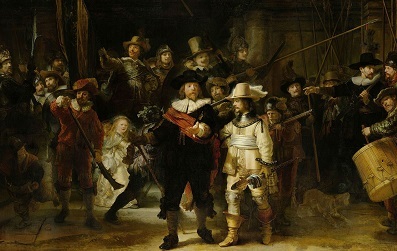 A parallel development may be seen in Rembrandt’s skill as a printmaker. In the etchings of his maturity, particularly from the late 1640s onward, the freedom and breadth of his drawings and paintings found expression in the print medium as well. The works encompass a wide range of subject matter and technique, sometimes leaving large areas of white paper to suggest space, at other times employing complex webs of line to produce rich dark tones. 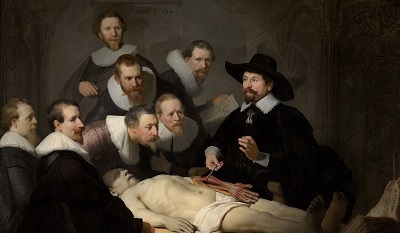 Technical investigation of Rembrandt’s paintings in the possession of the Gemäldegalerie Alte Meister has been conducted by Hermann Kühn. Belshazzar’s Feast in the National Gallery. Rembrandt produced etchings for most of his career, from 1626 to 1660, when he was forced to sell his printing-press and practically abandoned etching.